This D-Link camera allows you to keep an eye on your precious baby using your Smartphone or tablet instead of having a separate receiver to carry around with you. 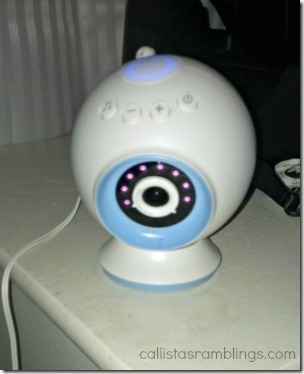 Since it uses Wi-Fi you can view your baby even while away from home! So when my husband is working midnights for example, he can take a peek at his baby sleeping to connect with home. When you open the box and pull everything out, this is what you’ll see. 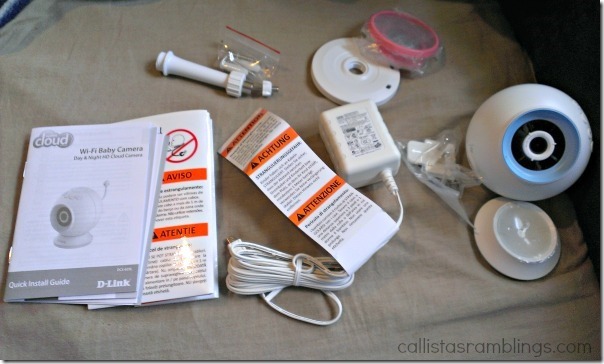 Camera and base plus cord, accent ring, mounting hardware, instructions and warning stickers in other languages. When the camera is assembled and plugged in while on a surface it looks like the below image. So how do you view your baby? Once you have it all set up, you simply need to open the app on your device and view your phone. This is the image on my phone at night. It’s quite a clear picture thanks to night vision. During the day the image is in colour. You can see the eerie glow of my son’s open eyes looking into the camera. Across the bottom you can see various buttons. From Left to Right they do the following: turn on speaker so you can talk to the baby from your device (or turn it off), take a picture or video, turn off all alerts, choose a lullaby and mute sound. The far right tells you what the room’s temperature is. You will get an alert if the room is too cold or too warm and the light on the top of the camera itself will also change from green to blue (cold) or red (hot). If the camera detects movement or sound, alerts will show up on the screen and you can acknowledge each single alert or all of them at once by touching the exclamation point. That I can use my smartphone instead of another receiver. I usually have my smartphone near by and it’s easily portable from room to room. I love that we don’t have to be in the house to view the camera. So while I’m viewing my phone to keep an eye on baby, my husband can view her from work too. This also makes it awesome for camping. I take a baby monitor with me to Girl Guide camps and often the range of the receiver isn’t very far so we have to stay close to the baby. This way I can give my babysitter the password and she can monitor the baby from anywhere in camp and I can check in with her too. I love the two way audio and that you can turn the lullabies on and off via the phone. You can also set the lullabies to play for a certain length of time. It’s supposed to be easy to use but I found it confusing. The instructions say very little because the app is supposed to walk you through set up but I would have liked instructions and troubleshooting for each step of the app. I had a heck of a time getting it set up with my Wi-Fi because I have WEP security as opposed to WPA. I can’t change to WPA though because it doesn’t work right for some reason. I finally got it connected but I’m still not sure how I did it. I’m still confused when I use it. I open the app and it takes me a minute to get to the right spot. I’m still figuring it out but once I get the hang of it it will be great. While I think the instructions should be full of more information, the product itself is amazing and I’m excited to use it with my new baby who will be here VERY soon. 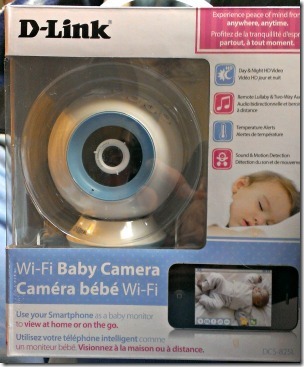 For More Info, see the D-Link Wi-Fi Baby Camera website.